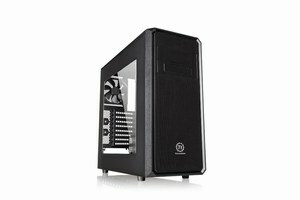 The new Thermaltake Versa H35 Window mid-tower chassis is especially designed for gamers as well as home-computer builders. With modular drive racks design, Versa H35 creates enough spaces for high-end hardware and expansion. The ample ventilation options, cleanable air filter, and a perforated mesh bezel help to keep the entire system cool and dust-free. Also, Versa H35 delivers advanced liquid cooling solutions and stress-free cable management to customize user-s computer or gaming system.